Magnesite a chalky white mineral that forms in rough nodules looking faintly like the vegetable cauliflower. It may have brown or black surface crazing or veins. Its mineral name is magnesium carbonate. It is a fairly soft and porous stone which readily absorbs dyes. 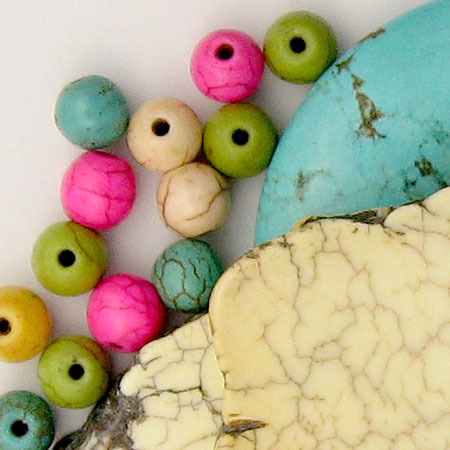 Magnesite beads are frequently dyed a variety of vibrant colors. In addition, magnesite is often dyed turquoise blue and used as a turquoise simulant. In its natural, white form it is sometimes marketed as white turquoise. Magnesite is commonly believed to bring deep peace and silent relaxation during meditation, stimulate passion in the heart and help strengthen bones and teeth. Care: Use warm, soapy water to clean magnesite. Never use steamers or ultra-sonic cleaners. Malachite is a copper carbonate and is formed from copper-containing solutions. In fact the green patina seen on copper roofs is a form of malachite. Malachite is banded in light and dark green layers with concentric rings, straight strips or other shapes. The shade of green depends on the presence of water in the copper; the more water the lighter the color. Malachite was mined in the Sinai Peninsula in 4000 B.C. Ancient Egyptians, Greeks and Romans used it for jewelry, amulets, and as a powder for eye shadow. It is also used as pigment for mountain green. Russian tsars used malachite for decorating their palaces, churches and public buildings, paneling walls and creating beautiful inlaid works. Azurite, which is a blue gemstone, is the chemical twin of malachite. The two are often found together sometimes transitioning seamlessly from one to the other. Malachite is said to aid in the regeneration of body cells and lend extra energy. It is believed that gazing at malachite or holding it relaxes the nervous system and calms stormy emotions. Malachite is thought to bring harmony into one's life, and give knowledge and patience. Care: Malachite is a relatively soft gemstone. Protect it from scratches, sharp blows and dramatic temperature changes. Wipe with a soft, damp cloth to clean. Do not immerse in water; you could dull its finish. Never use steamers or ultra-sonic cleaners. Warning: Malachite dust is highly toxic. Mookaite is a variety of jasper mined in Australia. It combines shades red and yellow jaspers in one stone. 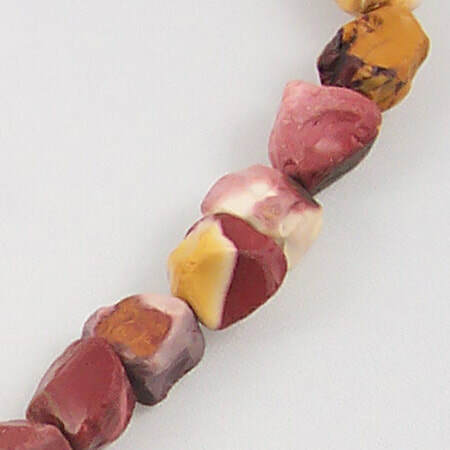 ​Mookaite comes from Mooka Station the name of the 700,000 acre sheep farm where it was found. ​It is believed to inspire the desire for new experiences. Mookaite also imparts a deep calm while encouraging versatility. Moonstone is a member of the Feldspar family. Its name comes from its almost magical shimmer that resembles moonshine. Moonstone can have a body or main color of white, gray, yellow-gray or peach. Romans thought moonstone was formed out of moonlight and began wearing it in jewelry around 100 B.C. In the middle ages, Europeans thought by looking into moonstone you would fall into a deep sleep and see the future. Moonstone was used extensively in the Art Nouveau jewelry of the early 20th century. Moonstone will pick up the colors near it, making it a stone that goes with everything. It’s recommended to hold a moonstone in your mouth to refresh your memory. 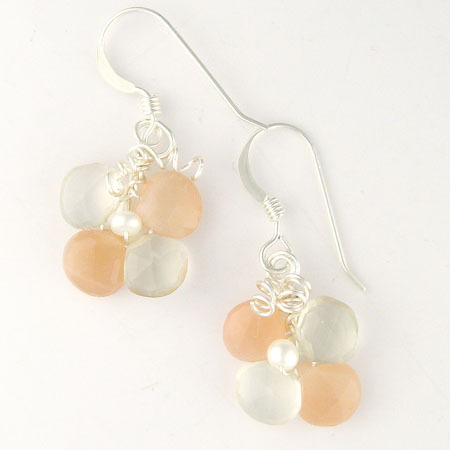 Moonstone is also said to soothe stress and stabilize the emotions. Morganite, also referred to as Pink Beryl, has a dazzling brilliance and soft color that runs from clear pink to soft peach. Other members of the beryl family include Aquamarine, Emerald and Heliodor. 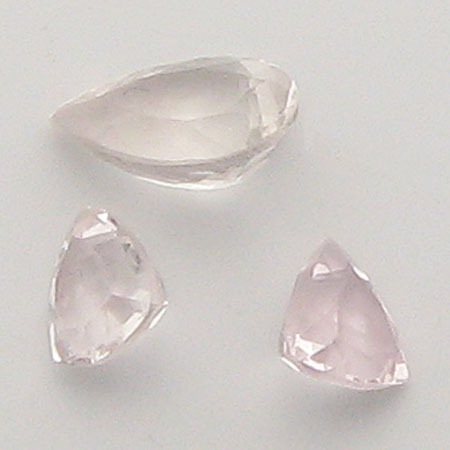 ​Morganite is named after banker J.P. Morgan, who was an avid gem collector. Its rarity keeps it from being used in manufactured jewelry, so it remains a connoisseur's gem. Morganite is a durable gem perfect for everyday wear. It is often called the stone of Divine Love. It is believed to help release unhealthy emotional patterns, aid in developing trust and bring a sense of joy and inner strength. Care: Clean with mild dish soap; use a toothbrush to scrub behind the stone where dust can collect.